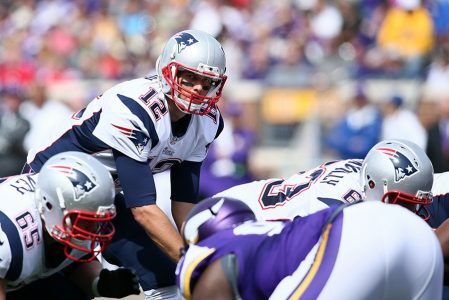 The 6-4 Minnesota Vikings will visit the 8-3 New England Patriots at Gillette Stadium, Foxborough, Massachusetts Sunday afternoon. The Pats are coasting to another division title but are battling Kansas City and Houston for the best record in the AFC. The Vikings sit in second place in the NFC North and are currently holding down the No. 5 seed in their conference. The Vikings are off a solid 24-17 win over Green Bay in a game where its defense held Green Bay’s Aaron Rodgers to a season-worst 198 yards. Minnesota QB Kirk Cousins threw for 342 yards and three touchdowns without a pick. Cousins ranks fifth in the league with 3,289 yards to go with 22 touchdowns against seven interceptions on the season. Defense will be key for the Vikes to keep up with the Patriots in this matchup, and head coach Mike Zimmer knows it. Vikings are 19-7 ATS in their last 26 games in December but only 1-6 ATS vs. a team with a winning record and 2-6-1 ATS in their last 9 games following a straight up win. Over is 6-1 in Vikings last 7 vs. a team with a winning record and 5-1 in their last 6 road games. Last week New England came off its bye and avoided a second straight defeat with a 27-13 victory at the New York Jets. Quarterback Tom Brady threw for 283 yards with a pair of touchdowns and zero interceptions. Sony Michel recorded 133 rushing yards and a score as the Patriots outgained their opponents 498-338. That was an important win for New England after taking a 34-10 loss at Tennessee prior to its bye week, but Patriots head coach Bill Belichick knows this will be far from an easy game. Patriots are 17-7 ATS vs. a team with a winning record and 8-1 ATS in their last nine games in December. Under is 4-0 in Patriots last 4 games overall and 6-1 in their last 7 games in December. This will be the Patriots will play in Foxboro for the first time since Nov. 4, but keep in mind that the road team is 4-1 ATS in their last 5 meetings. Our recommendation is to take a stab at Minnesota Vikings +5.